My Adventures in Pizza Making [Weekend Cooking] – my books. my life. So here is my inaugural Weekend Cooking (hosted by Beth Fish Reads) post. Like I said, I’m broadening the scope of this blog once again. As part of this, I hope to join in with some cooking/baking posts now and then. In an effort to eat healthier, Ben and I are trying to make more things from scratch. And because the baby doesn’t seem to like takeout pizza anyway, pizza was one of the first things we thought to try in this new made-from-scratch life of ours. First Attempt. A Learning Experience. I used my best-friend-from-law-school’s recipe. She makes excellent pizza and I helped her once a few years ago. So I thought I’d start there. But I think I needed a bit more direction than her recipe card and supplemental text messages could give me. I had a hard time kneading it. And I kept adding flour but it stayed sticky. When cooked, parts of the pizza were fine but others were very doughy. More flour was probably the solution (despite my thought at the time that I’d added a truckload already). Second Attempt. Enter the Stand Mixer. I switched recipes this time. I used the one out of the cookbook that came with my shiny knew stand mixer. Which, by the way, is my new favorite thing in the world. No more kneading for me. Now that I understood where I went wrong last time, I made sure to add enough flour. And it was completely edible! We ate practically the whole pizza in one sitting. So my next step is to give the pizza dough some more flavor. Suggestions? I always add stone-ground cornmeal to my crusts because we love the texture and flavor. I add 1/4 cup to 3 cups all-purpose flour. Yes, you read that right. I use regular flour for my pizza. Yours looks great! Congrats. BTW: I couldn’t live without my cobalt blue KitchenAid mixer. Oh, love your mixer! Green’s my favorite color. Your pizza looks delicious! I love the color of the mixer! Pizza looks great making me very hungry! Maybe add garlic to the dough? Oregano? I love the color of your mixer too, and your pizza looks scrumptious. I agree with Beth F., I like cornmeal in my crust mixture, and a little olive oil too. 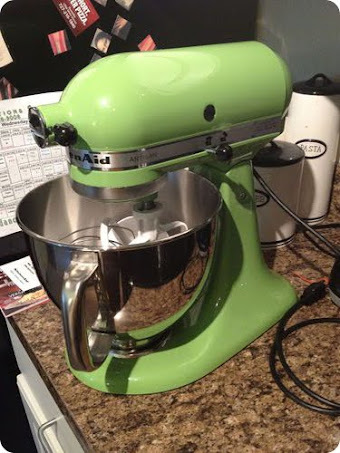 Love the mixer, pretty color! Your pizza looks delicious. If you want to jazz up the crust maybe coat it with a little bit of sesame seeds? My family loves a sesame crust. Love your mixer. And your pizza looks delicious! Yay! Welcome to Weekend Cooking. I love how Weekend Cooking “fits” my book blog. Sometimes, I review cookbooks or write other bookish things, but if it’s a recipe or a story from my life, that’s okay. Love your story! The pizza looks wonderful! 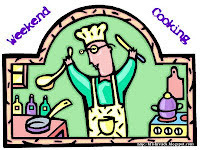 Welcome to Weekend Cooking! Your second attempt looks delicious. 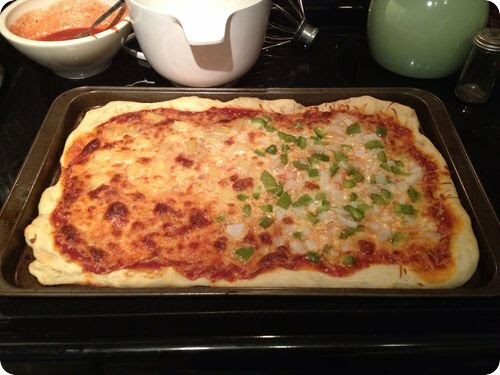 I love homemade pizza and have had great success with a dough from Perry’s Plate. I am making some today in fact. I like the idea of adding cornmeal for texture also. Whoops. Forgot to add it my twitter handle. One of those KitchenAid mixers is on my one day list! One day I will get one. I haven’t ever actually made pizza base before. We often buy bases or use pita bread as a base and then do our own toppings, but not the whole deal. I adore my kitchenaid cobalt blue mixer but I love the color of yours! I always cheat on pizza crust and use the one from Trader Joe’s. Congrats on your success! YUM. Looks delicious. I have made homemade pizza before using whole-wheat flour and it actually tasted quite good. (If you’re looking to be even healthier.) I would love to know if you decide to add anything to the dough and if it makes it taste better. Also did you make your own sauce? If so I’d love the recipe because I’ve only used store-bought. It was great seeing you yesterday! Oh yes, that stand mixer is my favorite thing in the world! I make so many things with it and it really saves a lot of time. I love the color of yours too. The pizza looks incredible. I need to get my dough hook out and make some of this for my family. They are pizza lovers to the extreme. Wonderful post today! I’ve been trying the same thing for the past couple months. Things from scratch taste so much better! I’ve tried several pizza dough and sauce recipes and so far this is by far my favorite! http://pinterest.com/pin/238550111482395580/ It was so good I made more sauce the next day to freeze and now just need to make a few helpings of the dough to freeze so I can whip it out on days I just don’t have to time to make it.